I don’t remember exactly how I acquired this tape, so instead I’ll tell you about another tape I found once while walking down the street in Burlington, Vermont. It had just rained, the ground was wet. I was walking down the sidewalk when there next to me, under a luscious, green hedge, beckoning me from the soft bed of damp mulch, was a cassette of Sade’s “Diamond Life”, sans case. I looked around, possibly to ensure someone hadn’t recently dropped it, or possible so as not to be seen, and then quickly snatched it up. There were droplets of water that had condensed within the tiny enclosed space between the two reels and the area of tape that had been exposed to the elements was warped. I doubted whether it would actually play, but I took it home and set it on the table to try for three full days. On the third day, with my gut twinging with anticipation, I once again picked up the tape and without hesitation inserted it into my boom box and hit play. The first second passed, the tape became taut and started to turn. The second second passed, I adjusted the volume. Third second, and suddenly there was sound… I hated it. Thankfully this post is not about Sade’s “Diamond Life”, it’s about the mysterious cassette in the picture above. 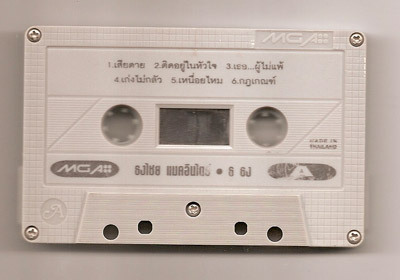 I know nothing at all about this tape other than it was made in Thailand. I listened to part of it once. It sounded like any of a thousand unsigned pop bands of the 80s, singing in a language I don’t understand. Nevertheless, it has remained a part of my music collection for at least the last ten years, if not more, as if to say “I need this, I just don’t know why yet”. I don’t know what happened to that Sade tape.